Selling a car on your own will ensure you get the most money for it. However, this can require a great deal of time and effort on your part. Selling it on your own means you will need to determine the vehicle's market value, advertise, and meet with potential buyers. This also means that you will need to allow strangers to visit your home in order to test drive, which can be awkward and time-consuming. Depending on how quickly you are looking to get rid of your car, you can consider placing ads on Craigslist, eBay Motors, Cars.com, Autotrader, AutoTempest, Beepi, or even on the Kelley Blue Book site. Your ad should have clear photos and a good description, along with a history report. Be upfront about the condition, maintenance and repair history, and previous accidents so that you don't have angry buyers coming back later. CarMax is a very dependable service, with more than 150 locations in 27 states. In fact, many drivers have found that the appraisal offered by CarMax was much higher than what they received at a dealership. Once you visit CarMax, you will receive an appraisal of the value of your vehicle. The process takes about 30 minutes and the appraisal will be valid for seven days, so you have time to make your decision. During those seven days, you can try selling it privately or see if you can get a higher offer at a dealership or another used car store. If you accept the offer within seven days, you can walk away with a bank draft in no time. Autotrader offers a number of solutions to drivers who are looking to sell their car in less time. You can take advantage of their Instant Cash Offer, which will allow you to sell your vehicle at a local participating dealer after receiving an instant online appraisal. They also offer services and packages to help you privately sell your car in less time and with less effort. If your vehicle is still in good running order, but you need a fast service that can come to you, consider a service like WeBuyCars. Car buying services like WeBuyCars will allow you to sell your vehicle in virtually no time. They will travel to your location, provide an instant appraisal, and can tow the vehicle away on the same day. If you accept their offer, they will issue a check on the spot and can even travel to your local bank with you, so that you can feel confident that the check will clear. You can trade in your car, if you are thinking of purchasing another one at a dealer. Once you visit the dealership, you will receive an appraisal of the value. If you accept the offer, you can use the value as a down payment on your next vehicle. Some trade-in programs will provide you with a future trade-in value, so you have a guaranteed trade-in price or resale value once you decide to sell it. Trading in at the dealer is possibly the easiest solution. You drive in with your old car and drive away in a new car, and the dealer will take care of all of the paperwork and hassle for you. However, in most cases, trading in will result in the worst price of all options. When you sell to a dealership, you can expect close to wholesale value, whereas if you sold it privately, you could expect close to retail value. This can be a difference of hundreds or even thousands of dollars. 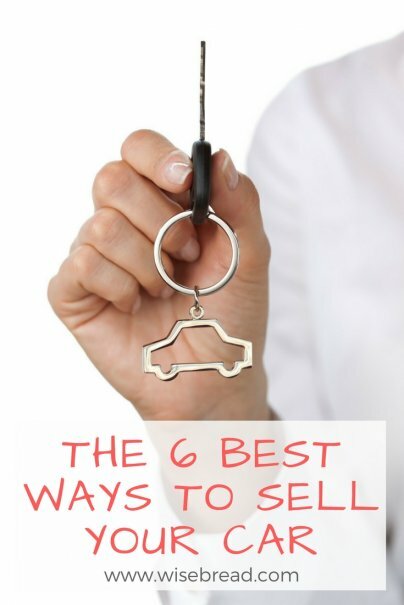 If your car is in high demand, it will be easier to sell. If you still find that you aren't getting any solid offers, there are some simple steps you can take to increase the resale value, so you get the most for your old car. In order to get the best value for your car, it's important that you know what it's worth.While these figures can provide a good basis for beginning a conversation, remember that you can always negotiate a price that suits both you and the buyer. Have you sold a car recently? What was your experience like?Please share your thoughts in the comments! I would add donating the car. Charities will sell it for you and the sell can become a deduction for your taxes.